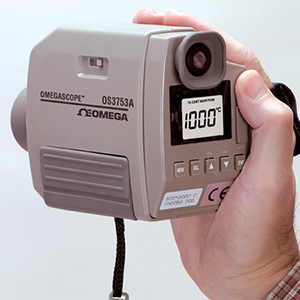 The OS3750A Series is a small, lightweight handheld thermometer with a clear viewfinder. The thru-the-lens optical system enables it to measure small targets from a long distance. The measured value can be read on the internal digital display in the viewfinder. Three models are available. The OS3753A IR Pyrometer combines the functions of a 2-color and single color wide range pyrometer in one model. The OS3751A is a single-color medium temperature range model, and the OS3752A is a single-color high temperature range model. The OS3750A Series can be mounted on a tripod or when there is no room for a tripod, on a fixed location by a universal head (sold separately). OS3750A-SOFT Datalogging Software Data logging software is available for easy data processing by a personal computer. Three kinds of data management modes are available: real-time trend mode, multi-point monitoring mode by utilizing memory, and 1-point historical trend mode. Graph display, report creation, printing, and data storage can be easily executed. The export of the measured data to worksheet applications is also possible. Note: Each unit comes with wrist strap, two AA alkaline batteries, mini-tripod and a complete operator’s manual.